March 17, 2019 Ubisoft is donating €500,000 to help with the restoration and reconstruction of the Notre-Dame Cathedral. Ubisoft has announced that it’s donating €500,000 ($564,000, £433,000) “to help with the restoration and reconstruction” of the Notre-Dame Cathedral, which was severely damaged in a fire that saw the building’s spire, and roof destroyed, as well as much of its original woodwork. In a press release issued earlier today, Ubisoft also announced that “we want to give everyone the chance to experience the majesty and beauty of Notre-Dame the best way we know how.” To that end, the company is giving away Assassin’s Creed Unity – which is set in Paris and features a highly-detailed digital version of the Cathedral – for free. The deal is limited to PC, and you’ll be able to download the game via Uplay or the Assassin’s Creed website for a limited time – Ubisoft’s press release says it’ll be available for one week, meaning you’ll have access to it from 16:00 today until 09:00 on Thursday, April 25 (depending on your local time). 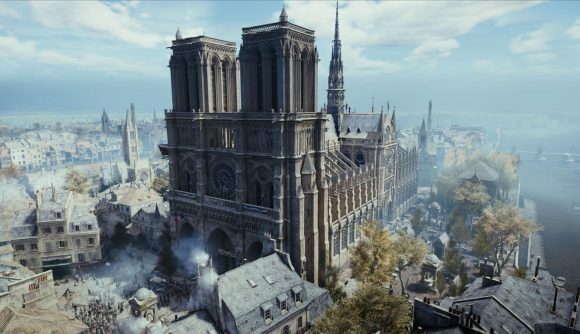 In a Q&A from Ubisoft, Miousse said that the game’s version of the building was built to an almost “1:1 ratio,” and guesses that around 5,000 hours over 14 months were spent on Notre-Dame alone. Unity’s version of Notre-Dame is not entirely historically accurate, as the cathedral’s spires were added to its real-life counterpart after the events of the game. Despite the differences, however, Ubisoft’s digital mapping could come in useful when attempting to rebuild the Cathedral.